Canning with an Italian theme! - Canning Homemade! Home » Chutney » Garlic » sauce » tomatoes » Canning with an Italian theme! Canning with an Italian theme! What a busy weekend for canning. We were blessed with the National "Can it Forward" yesterday and today I was busy with the ladies for our monthly canning group extravaganza. I was anxious to get back to canning some very different recipes and tried to keep this month's gathering to a very Italian theme. As many may or may not know I can not make spaghetti or pasta sauce if my life depended on it. It has eluded me for so long that I asked Susan who is one of the ladies in the group to come and give us a lesson in doing a safe but tasty recipe. Susan lived in Italy for 15 years on a whim, tired of what was going on for her here in the states and told us of her experiences living in Rome. Who better to teach me some of the tricks of making an excellent sauce than her? Well I was also very excited that my sister Cheryl was here from Las Vegas to share in the day and bring her Italian roots to the pot! Susan has been canning with me and the group since the first month we started and she has a flair with flavors. She brings tastes of all of her creations and this week was no different. Her combination with fruits are bright and creative and she is daring and tries some recipes that I would turn the page. This week I stopped turning the page and brought something different to the repertoire. We started with the pasta/spaghetti sauce. Susan's Saucy Sauce. It is a traditional marinara sauce without the meat but with enough acidity from bottled lemon juice to make it safe for water bath canning. There were seven of us today for canning so we doubled the recipe to make sure we had enough jars for everyone to take one home. I also wanted to mention that the color of this sauce is an incredible orange. Not from peppers, but from using the immersion blender and cooking it down for 2 1/2 hours while we did other recipes. We also decided that this sauce would be a perfect sauce for homemade pizza. Sauté onion, red pepper flakes & garlic in olive oil until translucent and just begin to brown. Add bay leaves, wine, salt & pepper and bring to boil. Add tomatoes, sugar & basil and let simmer for about 2-3 hours until thickens. Remove bay leaves. Blend with immersion blender after cooking about ½ hour just enough to make a smooth consistency as skins and seeds were not removed, or can leave with some chunks. Add lemon juice and pour into hot jars, wipe rims, remove air bubbles, fill leaving 1/2 inch headspace. Process for 30 minutes in hot water bath. Makes 10 pints. Our second recipe was the first of two daring choices. I wanted to work on something over the top that was different since we have all perfected the basics. 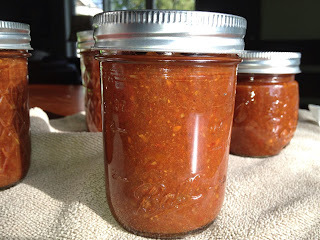 My choice was Roasted Garlic Jelly from the Ball Complete Book of Home Preserving Cookbook. It starts with roasting three heads of garlic in a hot oven drizzled with olive oil and balsamic vinegar. The finish is a sweet garlic jelly that smells fantastic. We are still working on it's use. We came up with bruchetta as the spread before adding the tomato mixture or as a side to a warmed brie cheese with crackers. The jars we made were the 4 oz size which was perfect for a taster size of an exotic jelly. Here is the recipe and the really beautiful picture of the completed jars. Roast garlic in 425 degree oven. In a medium stainless steel saucepan combine roasted garlic, wine, water, white balsamic vinegar, and peppercorns. Bring to a boil over medium heat. Reduce heat and boil gently for 5 minutes. Cover, remove from heat and let steep for 15 minutes. Transfer garlic mixture to a dampened jelly bag or a strainer line with several layers of dampened cheesecloth over a deep bowl. Let drip undisturbed for about 30 minutes. measure 1 2/3 cups garlic juice. If you don't have enough add up to 1/4 cup dry white wine or water. Prepare jars. Transfer garlic juice to a saucepan. Stir in lemon juice and sugar. Over high heat, stirring constantly, bring to a full rolling boil that cannot be stirred down. Stir in pectin. Boil hard, stirring constantly, for 1 minute. Remove from heat and quickly skim off foam. Quickly pour hot jelly into hot jars, leaving 1/4 headspace. 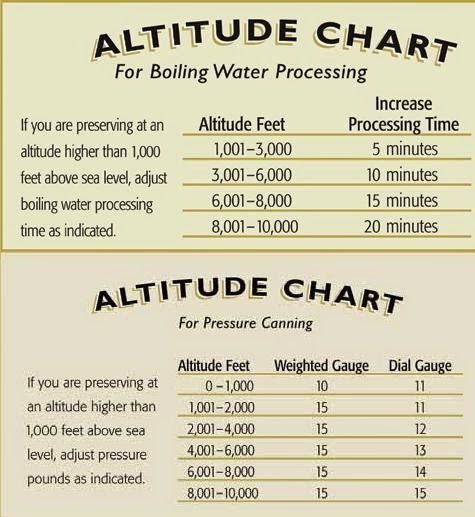 Process in water bath for 10 minutes, start timing when the water is at a full rolling boil. The last recipe, enticing to me because of the sun dried tomatoes, but extraordinary in combination of flavors; Cha Cha Chutney (Sun Dried Tomato Chutney) was given that name based on the look of it in the cooking pot. It "looked" like chili but has a taste that is out of this world. This evening my hubby made Tri-Tip steak and we used the chutney as a side. It was a perfect accompaniment to the meat. It had a flavor like a mild steak sauce with the occasional bite of the sun dried tomatoes. It wasn't overly spicy and even after only a few hours in a jar the vinegar flavor was mild and lost much of its pungency. It was really one of the best "chutneys" I have ever tasted. We doubled the recipe and it originally comes from the Complete Small Batch Preserving Cookbook. Combine tomatoes, onion, sun dried tomatoes and currants in a large stainless steel or enamel saucepan. Stir in sugar, water, vinegar, ginger root, garlic, curry powder, salt and pepper flakes. Bring to a boil over high heat, stirring occasionally. Reduce heat to low and boil gently, uncovered for 30 minutes or until chutney is very thick, stirring frequently. Tri Tip Steak with Cha Cha Chutney! Miranda's Blended Cha Cha Steak Sauce!